Student participation in elections has increased in the past few years. A recent report, “Democracy Counts: A Report on U.S. College and University Student Voting” from the National Study of Learning, Voting, and Engagement, an initiative of Tufts University’s Institute for Democracy in Higher Education, shows that between the 2012 presidential election, and the 2016 presidential election, student voting went from 45.1 percent of eligible voters in 2012 to 48.3 percent in 2016 – a 7 percent improvement. 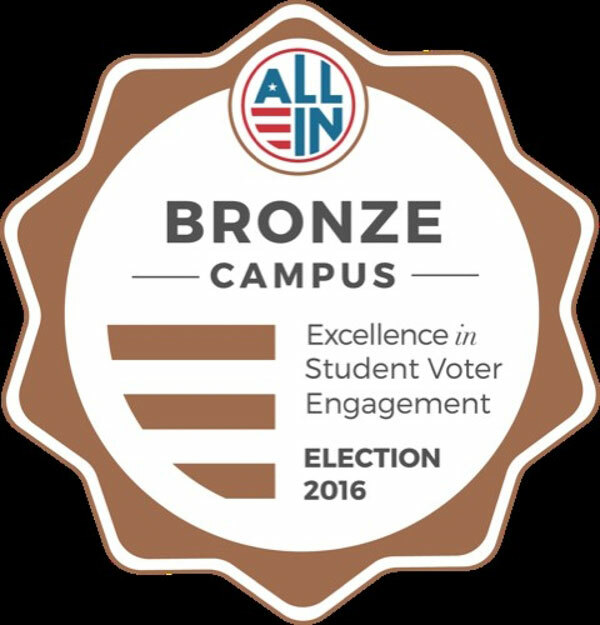 • Sharing their campus’s action plan and NSLVE results in order to be eligible for a recognition seal and/or awards. ALL IN determines student voting rates based on enrollment records institutions submit to the National Student Clearinghouse (FERPA-blocked records excluded) and publicly available voting files collected by Catalist. MGA students who are Georgia residents can register to vote or check their voter registration status at https://registertovote.sos.ga.gov/GAOLVR/welcome.do#no-back-button. Follow MGA ALL IN news on Facebook: @MGAisALLIN.